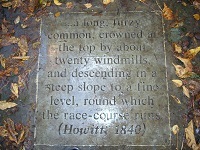 The photograph above shows the bell tower in Nottingham Arboretum. 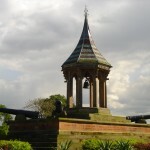 Designed by Nottingham’s borough engineer Marriott Ogle Tarbotton in 1857, the monument features two cannons captured in 1853 during the Crimean War with Russia and a bell seized in 1857 in Canton during the Anglo-Chinese War. venues for defence and recruitment, vegetable growing, communal commemoration.